As I was thinking last week about what recipe to post for today, my mind kept going toward ice cream. Might have had something to do with the fact that it was in the 90’s all week. And then when I came home Friday, I found a lovely surprise in my frig – 15 pounds of fresh cherries! So, naturally I decided to make some cherry ice cream. Homemade ice cream is generally much better for you (and much better tasting) than store-bought ice cream. And this dairy-free (vegan) ice cream is much less fattening than regular ice cream. Do you need an ice cream maker to make ice cream? 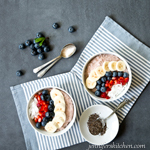 While there are ice cream recipes that don’t require an ice cream maker, I’ve found that most of them require sweetened condensed milk or whipped cream or eggs – all of which make the ice cream more fattening. Why Does an Ice Cream Maker Produce Superior Ice Cream? An ice cream maker freezes the creamy mixture at the same time as it whips air into it, and the result is a light and creamy frozen treat. There are other ways to make homemade ice cream, but I think an ice cream maker gets you the very best results. Older models required lots of salt and ice, but now you can buy ice cream makers that come with a double-walled canister that holds a chilling liquid within the walls. Before you make your ice cream, you put the canister in the freezer so the chilling liquid will freeze. (I usually just keep my canister in the freezer all summer.) When you’re ready to churn your ice cream, take the canister out of the freezer, add your mixture, and turn the maker on. You don’t need any ice or salt. An ice cream maker is soooo easy to use – you can have homemade ice cream in about 20 minutes! Here is the ice cream maker I use. 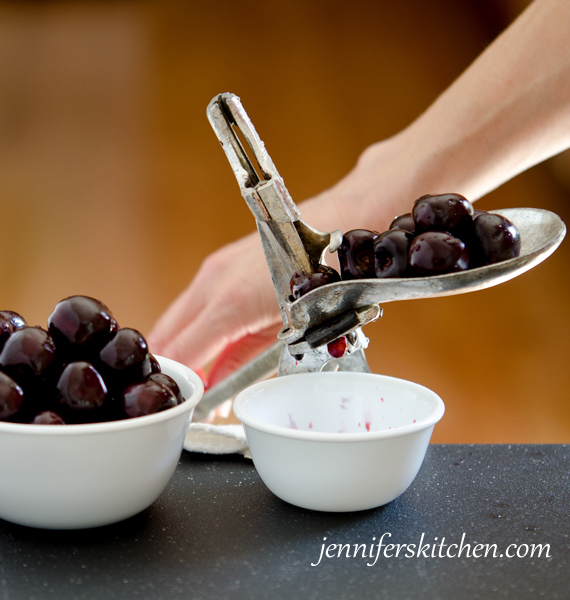 The easiest way to pit fresh cherries is to use a tool made for the job — a cherry pitter. It’ll save you bunches of time – you can pit hundreds of cherries an hour! And it’s easy to use. My kids put on the cherry pitter hat when they were 3-years-old. It made canning cherries a fun, family project because everyone – even the little ones – could help. They still make similar cherry pitters, both those that have a suction base and those that clamp to your surface. They also make hand-held models, but I’ve never tried one of those. They look easy to use, but it seems like you wouldn’t be able to pit nearly as many cherries as you would with the kind that attach to a surface and have a chute/cup to hold the fruit. 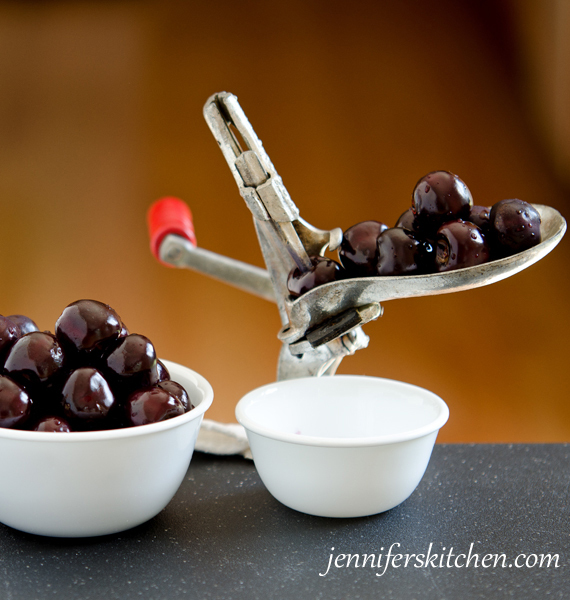 Click here to see a video we made of pitting cherries with a cherry pitter. We’re lovin’ cherry season! How do you get the pits out of cherries? What’s your favorite summertime fruit? What could be better than fresh, creamy, homemade ice cream? How about one that is much lower in saturated fat and refined sweeteners, and is made with wholesome ingredients? Place coconut milk, sugar, salt, and about half of the rice milk in a medium saucepan and bring to boil. Meanwhile, stir starch into remaining rice milk and mix until completely smooth. Be sure there are no lumps. When mixture in saucepan comes to a low boil, stir in starch mixture. Bring to a full, rolling boil, stirring constantly with a heat-proof spatula. Remove from heat. Place mixture in refrigerator to cool (at least 3 hours, but preferably overnight). When mixture is thoroughly chilled, stir in vanilla. Pour chilled mixture into a 1 1/2- to 2-quart ice cream maker and freeze according to manufacturer’s directions. 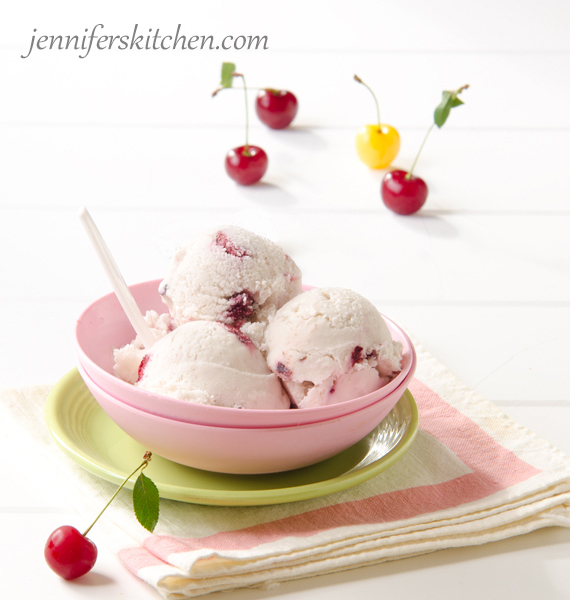 When ice cream is done churning, stir in cherries. You can chill the mixture in the freezer rather than the refrigerator; just be sure to stir it occasionally so it doesn’t freeze solid around the edges. Please see additional notes below this recipe. 1. While I don’t particularly care for rice milk, I’ve found that it offers a better flavor (over other non-dairy milks) in this ice cream recipe. 2. Be sure to use full-fat canned coconut milk. It’s essential for proper consistency and mouth-feel. 3. Even though there is a whole can of coconut milk in this recipe, the ice cream doesn’t have a strong coconut taste. You’ll probably love it even if you don’t like coconut. I love this post. I’ve been making vegan ice cream with my ice cream maker that’s very similar to yours. And I also use coconut milk, but your recipe is a bit different from mine. I’m going to try your recipe, and of course add some cherries. It looks soooooo good! Oh, I have a cherry pitter just like yours also. It works wonderfully. I always stain my fingers too much whenever I pit cherries, which makes me not want to do it. I’d never heard of a cherry-pitter before! Thank you for enlightening me – great pictures too! Jennifer, I made this ice cream today, and it’s was fabulous. My ice cream turned out kind of purple, because I used sweet black cherries, and the juice from the cherries turned the ice cream purple. It was so pretty. Just like you see at an ice cream shop. And so yummy! Glad you liked it! 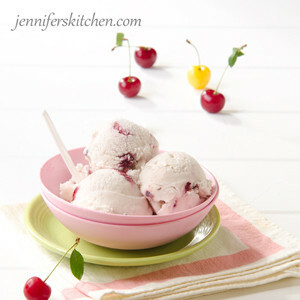 We gently stirred our cherries in when the ice cream was done to keep it white, but I like the idea of purple ice cream. Sounds pretty! We’ll try that next time. Since I cannot use any of those kinds of sugar, is it possible to use say, honey or artificial sweetner? Artificial sweeteners tend to make ice cream “ice-y” rather than creamy. I have found that pure maple syrup works great in homemade ice cream when I’ve used one part turbinado sugar and two parts maple syrup. The results were so good, I see no reason why it wouldn’t work to use all maple syrup if you don’t mind the maple taste. Because you would be replacing a dry ingredient with a liquid one, you probably would want to increase the thickener by about 1/2 to 1 teaspoon. if I just wanted vanilla ice cream would I leave out the cherries. 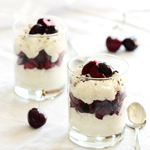 My daughter can not tolerate gluten or dairy and this would be wonderful for her but, she isn’t a huge fan of cherries, I suppose I could substitute strawberries if not but, her favorite used to be vanilla ice cream and it would be a real treat. Thank you so much, your mashed potatoes and oatmeal cookies are a real hit with her as well as my other kids. Yes, the ice cream would be delicious even without the cherries. Just leave them out.